My big race is seven weeks from this Saturday. After two months of physical therapy put me WAY behind on my training, I tweaked my training plan to fit the time I had left. However, my long runs haven't been happening according to plan. Last weekend's run was moved to Monday because of my (still unresolved and still here) breathing issues and dizziness. Monday, I had to cut my run short at seven miles because my left knee just wouldn't cooperate. It was so frustrating because I didn't even have a twinge of discomfort during my 10K. I keep asking myself: What am I doing wrong? Why can't my knees get healthy and STAY healthy? So with seven weeks to go, I feel completely unprepared. I have been feeling this way (unprepared) for a few weeks but just haven't wanted to give up completely. Monday night, I finally let reality set in and told my hubby I don't think it is going to happen. "Respect the distance" is the thought that keeps going through in my mind. Wasting the money and a coveted spot in the race is hard. But I also wanted this to really count, to see how I have improved. It's frustrating that you have to sign up so far in advance for most races. I understand the no refund policy. I don't understand the no transfer policy. Other than a little paperwork, probably most of it online, how much effort would it take to transfer my entry to someone who is prepared and really wants to run? Anyhow, enough of my rambling. Please tell me: What would you do? I am a very private person. Believe it or not though, I am more open on this blog than I am in my everyday life. It is sometimes difficult to push that "Publish Post" button. Other times it doesn't happen and I end up deleting a post that I can't bring myself to share. I'm sure I could scare some of you away with my honesty and lure in some other voyeurs, but I am what I am. In honor of my upcoming 100th post though, I am going to push privacy aside and answer any questions you might have. I was going to do "100 Things About Me" as my 100th post but got stuck on #5. And I knew it was a bad idea when even I was bored as I read back over the first four things on the list. So this is my solution: ask me a question and I will answer it as completely and honestly as I can. 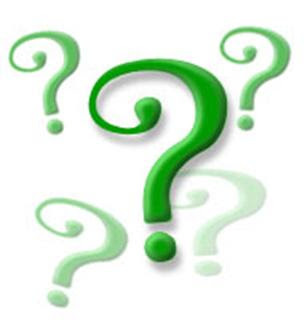 You can ask your question(s) as a comment to this post or email me at ihaverun@hotmail.com. Also, I just want to tell you how great you all are. You will never know how much I enjoy and appreciate all your comments! My last post was partly prompted by a nickname I received from another running/blogger, Tall Mom on the Run. Mel started calling me Runner Barbie sometime last fall; I thought it was hilarious the first time I saw it. Other than my blonde hair, I am about the farthest thing from a Barbie. Yet I take the nickname as a compliment. I don't come from a long line of active and physically fit or genetically trim and slim people. I work hard to stay in shape and be healthy. It doesn't come naturally and it doesn't come easy. I also take time each day to do something with my hair, put on clean clothes, and do what I can with a little makeup. If that's all it takes to be a Barbie, I'm going to take my Runner Barbie nickname and run with it. As for the runner part of my nickname, I took an unplanned break from running over the weekend. On Thursday, I started feeling dizzy and short of breath off and on. I decided running might not be the best idea and took it easy instead. When the symptoms didn't subside by the next morning, the hubby insisted I call my doctor. The doc didn't really have any guesses at what was causing my symptoms but ordered bloodwork and an EKG. I continued to feel a little off on Saturday but was almost back to normal yesterday. I haven't received the EKG and bloodwork results, but I figure it can't be bad news if I feel fine now so running is back on the schedule for tonight. Since I missed my long run on Saturday, I am doing 10 miles on the treadmill as soon as the girls are asleep. This is a somewhat forgiving picture. I had another one in mind that I wanted to share but gave up looking for it after 45 minutes (my "fat" period was pre-digital). I didn't look like that when I started running, but remembering how I felt when I did look like that is one of the reasons I run. My first year of college, I gained that dreaded freshman 15 and then some. I spent the next few years hating the way I looked but doing nothing about it. I finally joined a gym but never ended up going because I felt like everyone was looking at me and I didn't really know what I was doing. I got to the point where I really wanted to do something about the way I looked and felt though. About that same time, I had a roommate that knew how to eat well. She also introduced me to Karen Voight workout videos. 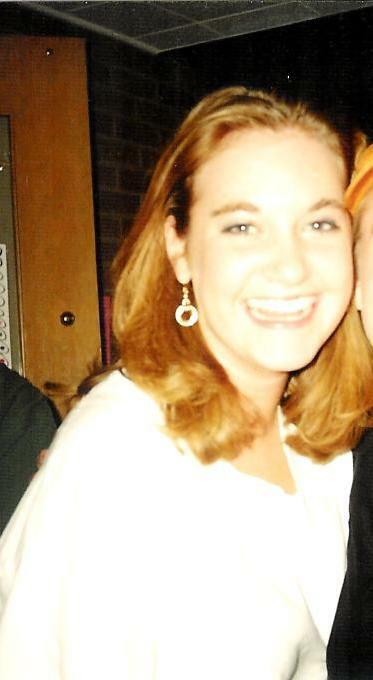 By that time, I was about 25 pounds (probably a few more even) heavier than I am today. Halfway through my last year at college, I started changing my eating habits (no more cooking and eating a pan of brownies at 11 pm; no more Taco Bell runs at 2 am; more water, more fruits and veggies) and started shutting myself in our condo basement with Karen Voight. By the time I graduated, I had lost over 15 pounds. It wasn't easy. I remember going to the movies and wanting to cry because my knees were so stiff and sore (from working out) when I stood up. But I also remember the first time I noticed the definition in my legs and when I could get back into some bright orange "Daisy Duke" shorts (yes I'm old) from high school. Over the next year, I lost another 10 pounds. When I got married, I weighed a few pounds less than I weigh today. After losing the weight, I became certified to teach aerobics and yoga. I usually taught 3-4 classes each week and hit the bike or elliptical trainer before or after a couple of my classes. When we moved to New Jersey for my husband's schooling, I stopped teaching but spent several hours a week with Karen Voight or in our apartment's gym. I became pregnant in 2005 and continued to work out pretty regularly through my pregnancy. I had my first daughter in March 2006. After about six weeks, I started doing workout videos at home. Then in June 2006, my cousin asked me to do a 5K with her. From the moment we signed up, we planned to walk since I would be pushing my baby in the stroller and running wasn't my thing. As we walked that 5K, I watched all the people running, especially the ones pushing their little ones in strollers. As we crossed the finish line (at 45:58), I realized I wanted to try running that race again the next year. I'm still not sure where that came from since I had ALWAYS hated running. In fact those 1-mile tests they used to make you do in P.E. were my most dreaded days. But I still decided to give running a try. I started slow and there was a lot of walking at the beginning. One of the things that kept me going was that it was something I could do WITH my little girl. Over the next few months, I bought a jogger and a treadmill. I ran the same 5K the following June, only this time I crossed the finish at 31:20. I think that might be the day I became a runner although it would take a few years before I started to call myself one. Gaining weight and then losing it (the right way) taught me things that I couldn't have learned any other way. There are still things I would change about my body. I am holding out hope that I will eventually run my way to thinner thighs. And my stomach has this weird thing going on since having my babies; I can't decide if it's cellulite or loose skin or what (but it's what keeps me from wearing a bikini). Even with the things I would change, I have learned to love my body. And having my girls helped me love and appreciate my body even more. Not just the amazing thing that is pregnancy, but looking at those two little people and hoping they have positive body images and grow up loving who they are, inside and out. I can't hope for that if I don't set the first example. What they take out into the world starts at home. When we were looking at pictures after we got home from Hawaii, I told my husband it was the first time I have ever looked at pictures of myself in a bathing suit and not hated what I saw. Admittedly running has helped tone some areas, but I don't look that different than I did in a bathing suit before I had kids or even pre-weight gain or post-weight loss. The difference isn't how I look. It's how I look at myself. Most of you know I spent a week in (Kauai) Hawaii recently. This was my first time in Hawaii, and it was amazing. The weather was perfect and the scenery breathtaking, perfect for playing tourist and for running. Because this is a running blog and because I still need to write a Hawaii trip post on my family blog, I decided to share a few of the highlights from my trip in pictures. I drove down the night before the race with my girls and my mom. I slept okay considering I was in a hotel bed and had a little girl glued to my side all night. In the morning, I dropped my girls off at the hotel where my dad (he drove up from Arizona and met us the night before) and mom were staying and headed to the race. It was a little colder than I expected until the sun came up over the mountain to warm things up just before the race started. The first couple of miles had some little rolling hills, but it was downhill overall. And thanks to all who prayed to the weather gods for no wind. It was a perfectly calm day. The first half of the race was on a pretty little trail through Snow Canyon State Park and the rest was on quiet neighborhood streets. I kept my pace pretty steady. I knew I had to keep it below 9:19 to PR and was surprised to see it below 9:00 so often. On the bus to the start, I sat by a guy that ran the race last year. He warned me about a hill at mile 5, so I was prepared mentally and physically as I hit it. It is times like that when I know how much running REALLY is mental! As I approached the finish, I was a little distracted looking for my family and didn't notice a clock anywhere. I still don't know if there was one. When I stopped the G-man, it said 55:00 exactly. PR! And when they posted the official results, an even better PR! My mom and littlest midge met me at the finish while my dad was entertaining my other midge and her cousin at the playground. This was my first race with spectators other than my hubby and girls; it was fun to have my parents there. My mom was even nice enough to take some pictures while holding my little one. After this race, I felt better than I have after any other race. My runner's gut stayed in check other than about five minutes of rumbling. My legs felt good and were only a little sore the following day. Thank you speedwork (and Imodium). My parents headed back to Arizona and I headed home with my girls after the race. I had originally planned to go to Arizona for a few weeks but felt a little overwhelmed with all I need to get done at home (catch-up after the trip to Hawaii, a big work project, and our taxes). And we will see my parents again since they will be back up here in less than two weeks, so I decided to postpone my trip. Now I'm home and refocusing on marathon training. Only 8 weeks to go! It's hard to believe exactly one week ago, I was snorkeling at sunset in Hawaii. The past week has gone by so quickly. There hasn't been as much running as I'd hoped, but I did get a final pre-race run in today. I'm giving my legs a rest tomorrow. Tomorrow afternoon I am driving the three and a half hours to where the race will be held on Saturday. 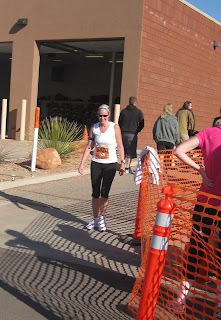 I am running the Spectrum 10K in St. George, Utah. My last 10K race was in July; my time was 57:48. I am really hoping for a PR this weekend. Please pray to the weather gods that it is a calm day. After several windy runs in Hawaii and today's very windy run, I don't think I can stand another one. I would rather have a hilly run than a windy one! I'll be back next week with a recap of my Hawaii trip (finally) and a race report (of course). Holy busy bloggers! I just checked my Google Reader and found 520 new items! I'll have to get to that later though. I'm back from paradise so it's time for the winner of the GU Giveaway. I called my hubby at work and had him choose a random number to determine the winner. Based on his unbiased selection, the winner is Libby at 0 to Runner! 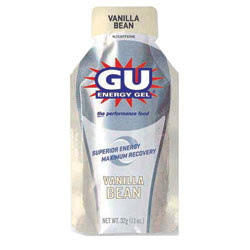 Email me your address and I will get the GU in the mail. I plan to share more details of my trip to Hawaii and my runs there later this week, but I have to get back to the mountain of laundry surrounding me. I need some clean clothes to pack because in a few days I am heading to Arizona (with an overnight stop in St. George to run a 10K). In the meantime, here is a peek at what it was like to run in Hawaii. Remember last week's post about running being hard? That was again true during Monday's speedwork. In the middle of 5.3 miles, I did 3 x 1600 @ 8:20 each (w/3 minute recovery). Halfway through the second 1600, I thought I was going to die. I realized I was gasping for breath so I really focused on my breathing after that. It wasn't easy but was certainly more bearable, and focusing on my breathing was a good distraction. The most remarkable thing about the run: less than two weeks ago, Alicia and I were talking about her speedwork and how I could never do my 1600s in 8:27 like she does. She thought I could and said I would probably surprise myself if I tried. I can do my 800s that fast or even a little faster, but 1600 is twice as far my friends. But I did try. And I did it. It's amazing how much someone's confidence in you can push you to do things you didn't think were possible! There are 10 miles (on the treadmill) on the schedule tonight and a tempo run on Friday. I am hoping to get an update on here between now and Saturday, but I have a special post written and scheduled for Friday in case that doesn't happen. My to-do list from Monday is blissfully smaller already. I have even packed over half our stuff for Hawaii. It helps that it is too cold here to wear most of what we need to pack. This will be my first trip to Hawaii. I am really excited, but not as excited as my little midge though. She will be 4-years-old on Sunday and has been telling everyone for months that she is going to Hawaii for her birthday. During last weekend's tsunami scare, we prepared her for the possibility that we might not be able to go. We even offered Disney World or Disneyland in exchange, but her heart was set on Hawaii. All she really knows about Hawaii is there is a beach and three swimming pools and she will get to swim. We are also going with some friends she adores. The only way she would settle for Disney was if they came too. Luckily we are still going to Hawaii so all is still right with her world. All my runs will most likely be on the treadmill because the hubby is out of town. The treadmill is probably better for me right now since some ITB/knee pain on Saturday cut my planned eight mile run down to seven. I hope to do a few miles Tuesday and some recovery miles Thursday as well. There will be no running Saturday because that's the day we head to HAWAII! My cousin called this morning to invite me to do a relay with her and some of her friends (one of them dropped out at the last minute) this weekend. I was a little bummed because I really want to do a relay and this one is a qualifying race for the St. George Marathon runner series. I guess a week of running in Hawaii is a pretty good trade. In addition to running, my week will be full of: making birthday cupcakes for preschool on Tuesday, a music program for the parents at preschool on Tuesday, my annual girl exam on Wednesday, a follow-up appointment with my ortho on Thursday, birthday party for the biggest little midge on Thursday, making a birthday cake for the party, parent/teacher conference on Friday, packing for four people and a dog (he's going to play with his puppy cousins for the week), finishing up a work project, and last minute birthday and vacation shopping. I also plan to throw a little blogging and blog reading in there when I can. Hope you all had a great weekend full of great runs (I know Redhead Morgan did)! What were your weekend running highlights?